The Japan Amateur Baseball Association (JABA) nominated Satoshi SEINO (70) to become President at their Councilors’ Meeting, followed by the Directors’ Meeting in Tokyo on May 11. 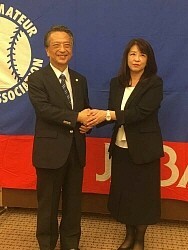 SEINO succeeded Norio Ichino (77) who served as JABA’s president for 8 years and elected to be its Honorary President. The JABA President SEINO was President of the Japan East Railways which has two strong industrial league teams along with Japan Hokkaido, Japan West, Japan Shikoku and Japan Kyushu Railways. For the first time in JABA’s history, a woman Director Yoshii OKAZAWA (54) has been elected as one of the 21 Directors. OKAZAWA used to work as a renowned sports reporter of The Mainichi Newspaper (photo). Kozo OHTAGAKI, Toshiyuki YANAGI, and Katsumi HIROTA were chosen as Vice Presidents, and Hiroo NOBATA as Executive Director. JABA, the domestic organizing body of Japanese Industrial League, comprises 356 member teams as of April 27, 2018, up by 4 teams from 2017. President SEINO believes JABA organization fits well with the traditional Japanese corporate culture and commented that he will strive to make it more appealing to spectators and fans and, at the same time, promote baseball among youth in the face of the declining birthrate.The woman Director OKAZAWA would like Japanese women to know that JABA players are cool not only in uniform but in work clothe and business suit alike. JABA will send its National Team to 18th Asian Games in Djakarta, Indonesia in August, 2018. Further, the year 2019 is set to be a milestone year for JABA as it celebrates the 90th anniversary of the National Inter-City Championship.